A list of eligible clubs in the district. A list of current district council members (club presidents, vice presidents education and district leaders eligible to vote). Ballots must indicate the office being contested or be sequentially numbered for each contested election. Names of candidates nominated by the district leadership committee may be printed on district ballots. Floor candidates’ names cannot appear on district ballots. Ensure ballots are numbered sequentially, either on the stub or on a cover page, and that a list of those eligible to vote is available. Cross reference all ballots issued with the current list of district council members. Ensure all ballots issued are signed for upon receipt. Either the club president or the club vice president education may designate, in writing, any active member in good standing of the club to act as a proxy or proxies and cast one or both of the club’s ballots at the district council meeting. If one of those officers is not at the meeting and has not designated, in writing, an active member of the club to act as proxy or proxies of the club at any council meeting, the other officer in attendance may cast two votes. The intent is to assure that every club will be able to cast two votes. No other proxies are valid at any such meeting. The officer or proxy holder in attendance must be deemed to hold the proxy of the other and may therefore cast two votes at the meeting. This assures that every club will be represented by two votes. No other proxies are valid at a district council meeting. District leaders must be in attendance to cast a vote. Contain all of the elements described above. Be delivered personally, by mail, by fax, by email, by electronic transmission or by other reasonable means to the club member who will hold the proxy. Be presented by the proxy holder in paper form (i.e. printed email) to the credentials desk. If the proxy does not bear a handwritten signature, it must have the typed name of the club officer(s) giving the proxy or some other indication that the club officer(s) authorized the proxy to be given. A proxy holder cannot transfer or assign a proxy to someone else. 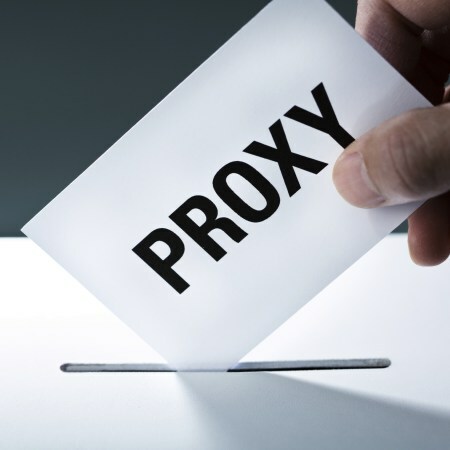 A valid proxy delivered to the proxy holder is revoked only if the club officer who gave the proxy destroys the proxy, cancels the proxy in writing, issues another proxy authorized at a later date or actually attends the district council meeting.